This quick release version of our magnesium platform pedal is the lightest on the marked, with an impressive weight of only 175 grams per pair! The pedals are sold with a MKS type quick coupling for the left pedal. We have improved the traditional design by making both the axle and the coupling hex shaped, so that the pedal axle can't turn inside the coupling. The pedal body is extruded and CNC machined in magnesium, and then powder coated black. 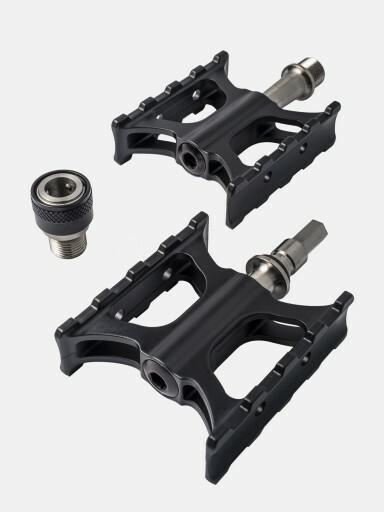 With a platform that are 75 mm long by 65 mm wide, the pedal is inherently light weight, but the platform is still large enough to provide a stable grip for your foot. Titanium are used for the coupling and 7075 aluminium for the sleeve - spring and balls are made from stainless steel. This pedal will save you 240 grams over the original Brompton folding pedal. A sealed bearing and a PU bushing are used to keep the pedal spinning smoothly. Additional seals are installed on either end of the pedal body to keep dirt and moisture out. We have also designed a holder, so the left QR Pedal can be attached to the rear frame when the bike is folded. The QR Pedal Holder can be found here. If you like to see how the Quick Release Pedal system work, we have made a small video that you can watch on Youtube.